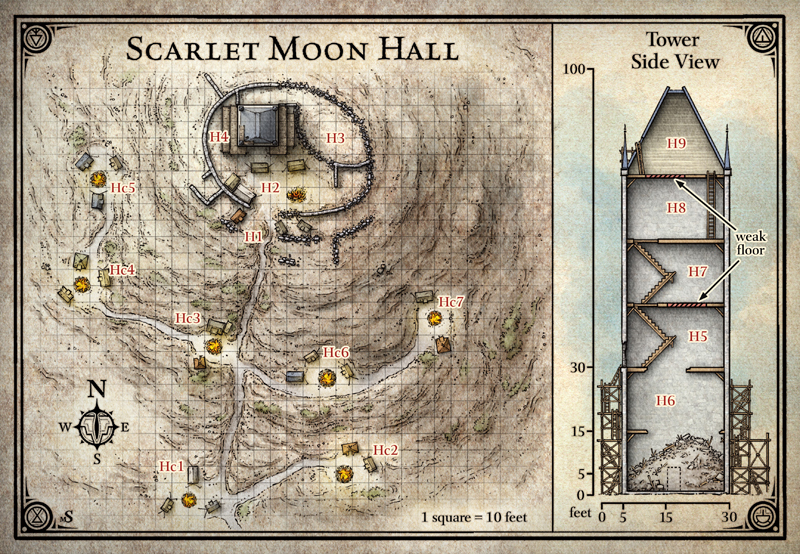 When translating the map of Scarlet Moon Hall to terrain, I had to take some liberties with the design due to practical constraints of the Dwarven Forge pieces I was using. The outside of the tower ended up being 8 inches wide, with room interiors measuring about 7 inches. This translates to about 35 feet, which is 10 feet bigger than the tower in the map. Because the Dwarven Forge walls are only an inch and a half tall (two inches including the height of the floor pieces), the stories in my tower were only 10 feet tall instead of 15. The scaffolding is more extensive in the map. I had to reduce it to only two floors of scaffold (compared with one every five feet) to match the scale of the Dwarven Forge pieces, as well as accommodate miniatures.